Darren Ferguson had warned that the rest of this season will probably not make pretty viewing. He was proven absolutely right for 90 minutes at the Keepmoat Stadium last night. 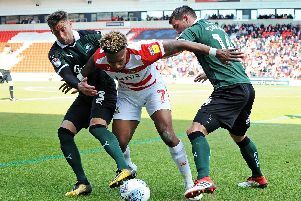 But it mattered not one iota as Doncaster Rovers ground out a precious three points to relieve the nerves and anxiety around DN4. Rovers were rarely anywhere near their best against a workmanlike Bradford side still searching for their first win under Simon Grayson. But they did what they needed to do, in rather dogged fashion, to net just their second win in 12 league games and, vitally, move seven points clear of the drop zone and up to 14th in the table. John Marquis was deservedly named man of the match for his game-changing late double, a powerful header and emphatic finish in stoppage time. But Ferguson also deserved credit for his changes with the game seemingly drifting to an uninspiring goalless draw. The early stages saw both sides at least try to play some neat football in spite of the bobbly surface but it was the visitors who offered more goal threat. When the ball fell kindly in the box for Timothee Dieng after ten minutes his close range header had to be hacked off the line by an alert Joe Wright. And Rovers survived another let-off soon after when Marko Marosi did just about enough to keep out Romain Vincelot’s downward header from a corner. Marquis was a focal point in attack for Doncaster and Luke McCullough purposeful with his passing but there was precious little else, other than two Wright headers which went over and wide, to warm the cockles of the home fans on a bitterly cold night. Marquis did raise the volume when he latched onto a through ball and volleyed just over but there was a growing sense of frustration in the stands as a nervy Rovers struggled to find any sort of fluency. Alex Gilliead was guilty of fluffing his lines just before the interval when a downward header landed at his feet in the box but he poked his effort just wide. The South Stand regulars did their best to lift their side following the re-start but Ferguson’s men continued to find it difficult to get any change out of a Bantams back-line marshalled impressively by former Rovers loanee Matt Kilgallon. . Following a quick counter, substitute Joel Growdowski went close with his first touch for City but was off target with his clipped effort. Ferguson turned to Alfie Beestin for some much-needed inspiration and switched to a flat 4-4-2 with Matty Blair and James Coppinger on the flanks. He then introduced Ben Whiteman but the midfielder’s 25-yard effort which sailed into Row Z rather summed up an unattractive contest which had the visiting fans singing “If you’re watching on the telly, turn it off!”. It turned out to be good advice for those Bradford fans watching on the box as, completely out of the blue, Rovers broke the deadlock on 75 minutes. Niall Mason, who had moved to right back, whipped in a superb ball from out wide which just begged to be headed in and Marquis obliged with a thunderous connection. There was very little response from the Bantams and their night got worse in stoppage time when Rovers broke down field and Beestin played in Marquis who finished superbly, drilling through Colin Doyle’s legs. Rovers: Marosi, Blair, Wright, Baudry, Mason, McCullough (Whiteman 70), Rowe, Houghton, Coppinger, Kiwomya (Beestin 61), Marquis. Subs not used: Lawlor, Alcock, Kongolo, Williams, May. Bradford: Doyle, McMahon, Robinson, Kilgallon, Knight-Percival, Vincelot, Law, Dieng (Devine 59), Guy, Gilliead (Growdowski 59), McCartan (Gibson 73). Subs not used: Raeder, Poleon, Warnock, Breunker.